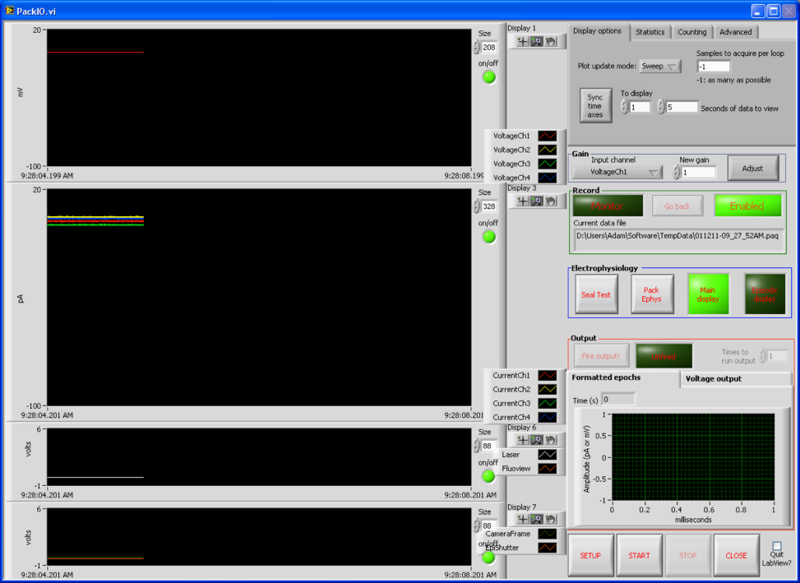 The software is useful for any experiment requiring acquisition and generation of data and can be triggered in several modes. During graduate school, I was making electrophysiological recordings and trying to synchronize various pieces of equipment (cameras, lasers, galvanometers, etc.). I found no software that was up to the task so I began a project to develop an uber-system capable of performing any data acquisition or generation operation that could be completed with the National Instruments DAQ hardware in use at the Yuste lab at the time. I jokingly referred to the project as “PackIO”, a combination of my name and IO, as in input/output, as the software is supposed to be able to take any input or generate any output in any synchronized fashion. The name stuck and now PackIO is in use by members of Rafael Yuste’s laboratory, Jason Maclean’s laboratory, Roberto Araya’s laboratory, and I continue to use PackIO in Michael Hausser’s laboratory. Download and install (32-bit or 64-bit) LabVIEW Runtime Engine (free). Download and install DAQmx drivers (free). Download and run 32-bit or 64-bit PackIO! See wiki on How to view or import data created by PackIO. Please read the Github wiki. PackIO and EphysViewer are released under the GNU General Public License. Watson BO, Yuste R, Packer AM (2016) PackIO and EphysViewer: software tools for acquisition and analysis of neuroscience data. bioRxiv http://dx.doi.org/10.1101/054080 Software available from www.packio.org. Thank you to Rafael Yuste and all of the early beta testers in the Yuste lab. Mor Dar contributed some features to seal test and Carmen F. Fisac contributed the auto-incrementer available in version 273.